Now, when celibacy for Roman Catholic priests is being questioned as never before, McLean Brady shares a memoir of her own lived experience. 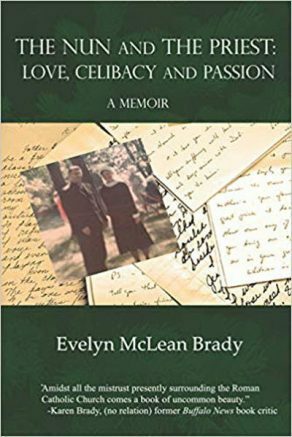 “The Nun and the Priest: Love, Celibacy & Passion,” by Buffalo author Evelyn McLean Brady, is the latest book release from Western New York’s NFB Publishing. Now, when celibacy for Roman Catholic priests is being questioned as never before, McLean Brady shares a memoir of her own lived experience. Based on her journals and Father Hugh Brady’s love letters written from 1965-1970, the author intimately chronicles the interior conflict between her desire to become a Catholic nun to “live only for God to serve others” and the unexpected attraction she feels for the handsome, charismatic Father Brady. When this novice and priest finally confess their feelings for each other, the mystery of human love unfolds, as do tests and trials they could not have imagined. The tension between McLean Brady and her mother also adds unexpected turns and detours to the tale. In the tradition of Abelard and Heloise and St. Francis and St. Clare, this is a love story of two celibates who desire to follow the ways of God yet are lured by the pull of the human heart. “Amidst all the mistrust presently surrounding the Roman Catholic Church comes a book of uncommon beauty,” said reviewer Karen Brady (no relation to the author), former book critic for The Buffalo News. Be the first to comment on "Local author, NFB Publishing release ‘The Nun and the Priest’"